This property is a combination of all the best things about the outdoors: hunting, farming, gardening, exploration, hiking, ATV access, and a dependable place of peacefulness. Towering evergreens greet you upon arrival, creating the feel of the Northwoods and a perfect separation between this slice of heaven and the rest of the world. Groomed trails provide access the entire property with multiple creek crossings. Metal sheds house everything you will need to maintain the property. A garden pavilion affords the perfect place for family gatherings or a picnic. Multiple fields create a patchwork of edges, attracting and holding game as well as providing substantial income potential through crop sales or CRP program income. Whitetail deer herd genetics are strong in this area and this property attracts and holds the best of the best in the region. Trophy bucks love seclusion, the safety of wooded areas and grasslands, and fresh water. This Boone County 100 has it all. Bedding areas and trails are used constantly by massive bucks on this property. Additionally, turkey flocks call several areas of this property home, roosting in the trees and traversing the length of the property on a daily basis. Finding a trophy tom turkey is a sure thing here. For the waterfowler, this is a rare find. A Wisconsin Control Flowgate provides complete management of the low water impoundment area fed constantly by freshwater creeks, creating a nearly 20 acre wide floodplain. This area is an irresistible draw for ducks from early season to the end. Geese flock to the same areas, nesting in the spring and staying the entire fall to enjoy the perfect habitats. A permanent duck and goose blind assures the hunter of known conditions and the comfort of having their own equipment, decoys, and even breakfast fixings right where they need it. Jump-shooting on the several creeks and the diversity of waterfowling areas make this a rare place in northwestern Illinois…with a feel reminiscent of the old-time duck clubs famous along Illinois rivers. If you want to catch the full season by attracting and holding the early flights and assuring access to the entire migration, this is exactly the way to establish a waterfowl property to create memories enough to last a lifetime. As you spend time on the Boone County 100, you will learn the nuances and special places. A creek separates the “Southern 9,” just the right amount of heavy cover, open space, and habitat to hold the big bucks through late season. Additionally the southernmost CRP field is perfect for archery hunting and successful pheasant hunts. An adjacent 10 acres, next to corn fields and cover, offer great upland hunting through the entire fall. 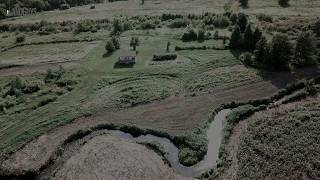 For the outdoorsman wanting a place to call their own, a place with areas to practice shooting and enjoy the fullest extent of each season, this property is perfect. The Boone County 100 is located just north of Poplar Grove, Illinois, on Beaverton Road. Easy access from major metropolitan areas is provided by tollways and highways. Give yourself the opportunity of a lifetime by visiting the Boone County 100. The world will slip away as you turn onto the gravel of Beaverton Road pass under the majestic spruce tress. You’ll likely want to stay the entire fall each year on this incredible recreational and mixed use property.